VCE Software is marketed and sold exclusively by its developer, Avanset. Free demo version of the VCE software can be downloaded here. With VCE Software, you purchase your subscription, not the download. Therefore, when your subscription expires, you will not be able to play your VCE exams before you renew it. 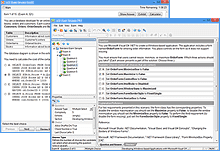 VCE software accommodates over 10 formats for exam questions, including multiple choice, fill in the blank questions, select and place / drag-n-drop questions, point and shoot questions (picking a point on the image), hot area questions (picking an area out of the few options given), create a tree questions, build list and reorder, matching questions, drop and connect questions. Easy printing - VCE software allows your files to be easily printed through VCE Designer. Easy importing. Various file formats can be easily imported into VCE software, including txt, rtf, PDF. (A tutorial on how to convert PDF into VCE files, which also includes some other tips and tricks, is available here). Recognized images. VCE software supports images in jpg, gif and png formats, which can be embedded in questions and/or answers in any VCE File. Support of foreign characters. The latest version of the VCE software supports foreign characters if opened with updated version of VCE Exam Suite. This is true for ALL non-English characters, including languages like Arabic, Chinese, Russian etc. As a result, VCE files can be used for various foreign language exams, as well as by users whose first language isn't English.